Either “Never tell a Lie” or don’t throw a Yard Sale | My Journey So Far…. There are thrillers and then there are some thrillers which are disturbingly weird. 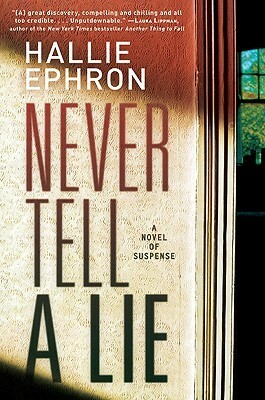 Yes, it’s the class of weirdness where Hallie Ephron’s novel “Never Tell a Lie” falls to. Story is about Ivy and David, happily married couple who are expecting their first child in few weeks. Being kicked by nesting spirit of pregnancy, Ivy decides to get rid of clutter and arrange for a yard sale. Everything was going on smoothly, until an old, not so friendly friend, Melinda shows up. Everything comes upside down when Melinda goes missing and her last known sight was at Ivy’s home. Story unfolds in such a way that it becomes hard to trust anyone around. Underlying idea behind this book is, should you share every secret with your partner, every mistake and every truth? A lie told to protect a relationship or a person, can it resurface from the past and shake your present and your future. While I was reading that book, a pregnant friend of mine ask me to suggest a good book to read. I was just about to say, “Never Tell a Lie”, and then I realized that, it’s so much disturbing story, of a pregnant woman, that no other pregnant woman should have to go through reading it. End was a bit disappointing for the feminist in me. Considering that Ivy, forgive everyone involved. Whatever happened in the past, and whoever did that, was a crime and a punishable one. Leastways, the author should have tried to explain the consequences. Previous PostPrevious PostNext PostBoss and Employee Sexual Relationship: Who is using whom?